On Monday April 15, The Center for the Study of Social Difference (CSSD) co-sponsors “Donde antes tú ahora el vacío.”: Mourning the Absent Bodies of the US-Mexico border in Sara Uribe’s Antígona González with CSSD Director Marianne Hirsch. 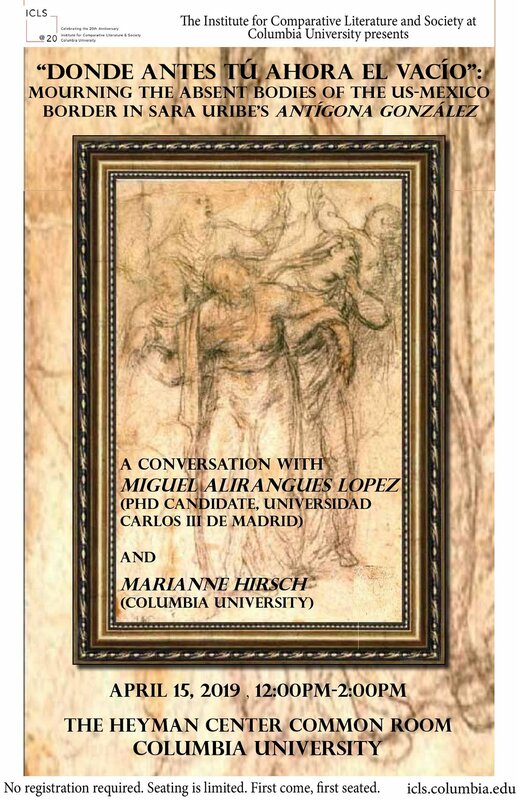 Organized by the The Institute for Comparative Literature and Society, the event will bring together Miguel Alirangues Lopez (PHD Candidate at Universidad Carlos III de Madrid) and Marianne Hirsch (Columbia University) in conversation, discussing Lopez’s work on Sara Uribe’s Antígona González. Mexican poet Sara Uribe is one of the most remarkable voices of her generation. Her influential work Antígona González (2012) is the story of a woman who searches for the body of her missing brother on the US-Mexico border, with the determination to bury him, just like Sophocles’ classical heroine. Miguel Alirangues (PhD Candidate at Universidad Carlos III de Madrid) and Marianne Hirsch (Columbia University) will be in conversation, commenting on Uribe’s discursive strategies to mourn the effects of generalized violence in the context of the Mexican Drug War.